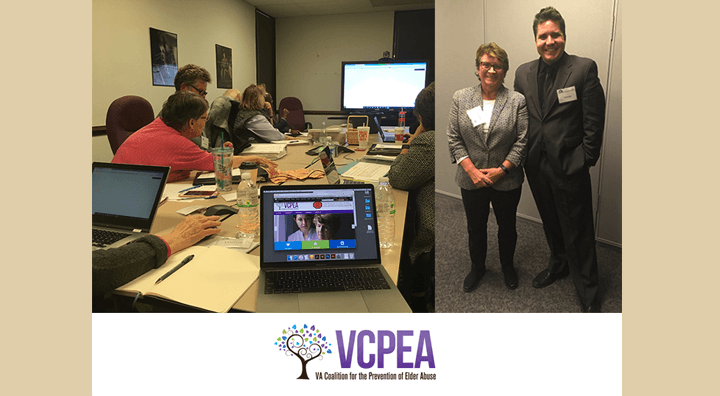 V4 Development was proud to collaborate with VCPEA (The Virginia Coalition for the Prevention of Elder Abuse) to launch the new VCPEA brand and updated website. To view the latest website and learn more about VCPEA's mission, please visit [http://www.VCPEA.org](http://www.VCPEA.org) --- **VCPEA's Mission Statement** VCPEA is a Coalition of individuals and organizations working cooperatively through public awareness, advocacy, and education to assure older Virginians a life free of abuse, neglect, and exploitation. Since 1993, VCPEA has been a leader in promoting awareness, training, and advocacy on behalf of Virginia's abused, neglected, or exploited adults. VCPEA seeks to: * Promote a greater public understanding and awareness of the problems of elder abuse. * Promote improvement of the quality and the availability of services to vulnerable adults. * Encourage the development of services and programs to protect elders and adults with disabilities who are abused, neglected or exploited, or at risk of abuse, neglect or exploitation. Virginia Coalition for the Prevention of Elder Abuse, Inc. (VCPEA) is a coalition of individuals and agency representatives committed to improving the lives of older and disabled Virginians. Our Board of Directors represents a variety of organizations and professions. We are service providers, practitioners, educators and trainers. We represent the area of social services, law enforcement, community mental health, academic programs, health care, programs for the aging, law, and state and local government.